Wow! What have we here? Is it a legendary forest stir-fry with chicken livers made by AlmazanKitchen? Yes it is! Do you know why this dish is so good? What is the secret? AlmazanKitchen mixes and tools? Yes, true, but it is also about effort! Everything is made with love in the beautiful outdoor scenery, of course not without help of Mother Nature’s energy we gathered around us.The best natureporn with foodporn awaits you! One video you do not want to miss at all cost! 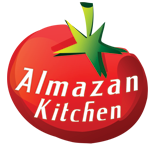 Only by AlmazanKitchen on YouTube! Wash 500g of chicken livers well. Slice it. Roast eggplant on coals for 5-7 min. (662 F°/350 C°). Unpeel the skin and chop it until mushy consistency. Salt well. Slice all veggies into strips. Place everything + livers inside wooden bowl. Season everything with 2 tbsp. of Almazan pepper mix. Preheat the pan, grease it with oil, toss step #2 into the pan, add 1 cup of coconut milk. Fry for few minutes, do not forget to toss and stir. Put aside. Toss #3 into the pan, fry for 5-7 min, salt well when almost ready. Do not forget to toss and stir or it will burn because of heat (716 F°/ 380 C°). Serve everything together; finish off with handful of chopped young silver onion. Crimson Chicken – Forbidden Primitive Ritual FoodPrimal Hanged Steak – No-One Has Done It Before! What does the Almazan pepper mix contains ??? Buradaki biber karışımı daha önce tavuk eti için kullanılan malzemeler mi?